I came across this story on the British newspaper website, The Telegraph. 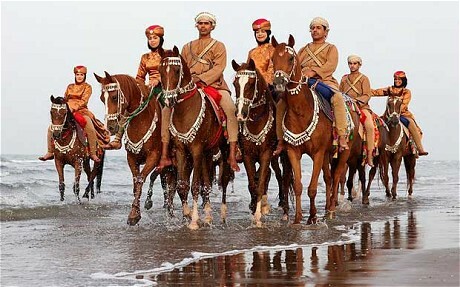 Oman have sent 112 horses and 200 soldiers to Windsor to partake and perform in the Royal Diamond Jubilee which takes place between May 10th and 13th - ie there's only 2 days left - and tomorrow's Sunday performance will be the last one. Not sure if it's available on OSN or OmanTV for us to view but if it is I'll update here. Anyway it's certainly a proud moment for Oman, not even a commonwealth country, that is sending what I understand is the single largest troop of cavalry to the Diamond Jubilee. If they weren’t wearing such colourful costumes, they would be a terrifying sight. Soldiers thunder across the Omani desert on horseback, hooves tearing up the dust as they bear down on our position. For a moment one has an idea of what it must have been like to face the full force of a cavalry charge in an era before tanks, machine guns and drones. And yet this particular cavalry aren’t brandishing so much as a penknife. The men ride barefoot in pairs, grinning broadly, their arms across each other’s shoulders, their horses’ tassels gleaming in the evening sunlight. The women, decked in glorious pinks and greens, are just as courageous. One, Zinab, even stands upright on the saddle, holding on to her galloping neighbour’s hand for scant support, as they tear past. This week, these strikingly attractive men and women of the Royal Cavalry of Oman will be performing in front of the Queen. To celebrate her Diamond Jubilee, the Royal Windsor Horse Show is featuring 800 performers from around the world, ranging from the Canadian Mounted Police to the Chilean Huasos, the Masai to the Pakistani Presidential Bodyguards, the Kremlin Mounted Cossacks to the Aborigines. The Omanis alone are sending 200 soldiers and 112 horses, transported on two specially adapted flights. It won’t be the first time that the Queen, who is, of course, a keen rider, has seen the unique skills of Omani horsemanship in action. Her second visit, in 2010, to the Gulf state coincided with its 40th birthday as a modern country, and was marked by an equestrian show featuring 840 horses and almost 2,000 riders. One incredible picture showed four horses being ridden by 10 men, standing on each other’s shoulders to form a pyramid. For a non-Commonwealth country, the ties between Britain and Oman are unusually close. A treaty in 1800 stated: “The friendship of the two states may remain unshook til the end of time; til the sun and moon have finished their revolving careers.” Today, 7,000 Britons, including 90 members of the Armed Forces, live and work in Oman. Its stated policy might be determinedly neutral – it speaks regularly to Iran, its problematic neighbour across the straits, while remaining a close ally to the West – but some friends are clearly closer than others. “It is an extremely warm relationship,” says Jamie Bowden, our man in Muscat. This warmth emanates directly from Sultan Qaboos who, even by the standards of Gulf rulers, is markedly Anglophile. In addition to the obligatory stint at Sandhurst, he served with the now defunct Cameronian regiment (they helped his father when he had a spot of local bother in 1957) and spent six months in the unlikely setting of Suffolk County Council, where he developed a passion for organ music and learnt about local government. Although he hasn’t imported the vibrant democracy of Ipswich wholesale to Muscat – Qaboos deposed his father in a coup in 1970 and remains a dominant, if benign, ruler – Oman is certainly more enlightened than other Gulf states. Protests last year resulted in more oversight for Parliament. And while many problems remain – notably a youthful population overly reliant on public sector jobs – a recent UN human development study put the country in first place in terms of improvement over the past 40 years in health and education. Even a brief visit reveals a people with the friendliness – but not the dissatisfaction – of the Levant and north Africa, and the wealth – if not its gaudy extremes – of its immediate neighbours. Qaboos is the longest-serving leader in the Arab world. The history of the Royal Cavalry closely mirrors the burgeoning confidence of Oman. Founded in 1974 by the sultan, it originally consisted of just 20 horses. Today, it operates as the Omani equivalent of the British Jockey Club, overseeing racing, show-jumping, polo and breeding programmes, as well as performing a ceremonial role for visiting dignitaries. The Firqah (ceremonial) squadron was created in 1993 and now consists of 140 soldiers under the command of Brigadier Razak and Major Mohammed Al Balushi, who also employs a former warrant officer from the British Household Cavalry as an adviser. Most of the squadron’s soldiers are in their twenties, having finished basic training with the army first. Their lives appear surprisingly unrestrained, a rare chance to pursue a portfolio career in the military. Raida al Bahry, a tiny 24‑year-old who looks half her age, races in the morning, practises the flute in the afternoon and is also a part-time actress. They have been practising every day for the last two months. Meanwhile, the al Obaidani factory in the capital, Muscat, is working eight hours a day churning out 10 uniforms (two for each performance) for each soldier. “When you design a new show, you have to be perfect,” says Brigadier Razak. The brigadier is anxious not to spoil the surprise, but we do know that the display will include the rakd al arda, the awe-inspiring galloping in pairs (no mean feat when you have no stirrups and are riding a solid, broad Arab saddle), as well as poems, chanting and the hairoob (which involves the riders having to persuade the pretty, but recalcitrant, Arabian horses to lie down). It will also feature the Royal Cavalry Mounted Band – Oman is almost certainly the only country in the world to boast a camel-mounted bagpipe band. If I were the Chileans, the Pakistanis, the Kremlin or the Canadian Mounties I’d be practising like a mad man, for I have an inkling the Omanis are going to trot all over the lot of them. If the effect is half as good as what I saw in the Omani desert, Windsor is in for a treat. I think ITV are making a programme about the event which will be shown during Jubilee Week in early June.